"Many a South Side youngster dreamed of making it to the big leagues while playing on the sandlots of Milwaukee. 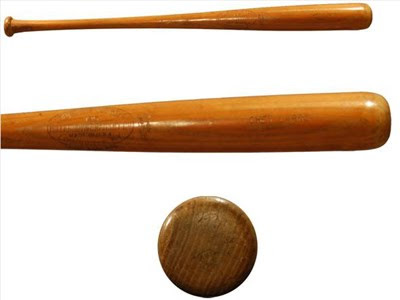 For Chester Peter Laabs, his dream came true ..."
"The hard-hit ball bounced twice on the second floor porch of a house on the south side of W. Burleigh St. before it was retrieved by a spectator viewing the George Meyer Co. Big Shore Store Triple A League game at the Auer Avenue diamond. The year was 1934 and the batter who smashed the Herculean clout was Chet Laabs, the stocky Meyer second baseman with the powerful wrists, one of the best sandlotters developed on the South Side." Young Chet Laabs was introduced to readers of the South Side Times by writer George Reimann and in his book Sandlot Baseball on Milwaukee's South Side back in 1968. Chester Peter Laabs was born in Milwaukee, Wisconsin on April 30, 1912. 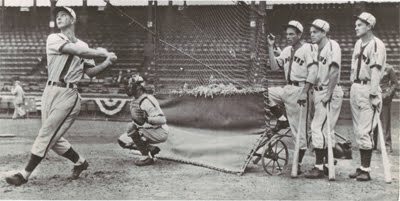 As with many of the youngsters, playing ball was a regular activity for Chet and he excelled at the game at an early age. He grew up in the south side neighborhood near South 4th and Mitchell Street. He began his amateur career at the age of 13. His hitting brought notice in 1930 when young Chet hit .518 for the Federation Life Insurance team. Chet started out as an outfielder but moved to the infield, playing 3rd, short and 2nd. He was a sometime pitcher for Wally Erdman's West End Merchants Major A team which won the League Championship in 1932. He set a record that year by striking out 17 batters in one game for the Merchants. Prior to his time with West End, Laabs played with the Braman Coals and the Federation Life Insurance baseball teams. Chet Laabs was considered extremely fast, one game, reaching base on bunts 5 times. His best years according to Reimann were 1932-1934 with a total of 45 extra base hits and a 6 for 6 day in 1932. That same year his batting average was a huge .468. 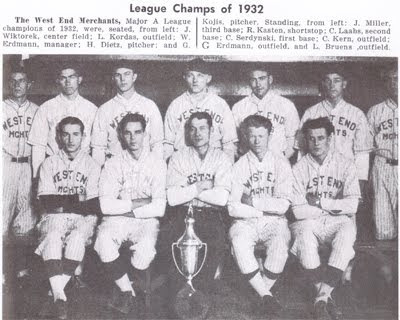 In 1933 Laabs helped to lead his Upper Vliet St. Merchants to the Major AA title with a .396 batting average. In 1934, Chet Laabs led the league with a .441 batting average. Chet was picked to play 2nd base on the amateur All-Star team by the readers of Wisconsin News for a charity game against the Milwaukee Brewers. It was here that manager Al Sothoron took notice and signed the young Laabs. Baseball scouts took keen interest in Laabs. The Chicago Cubs wanted to sign him to a contract but he was already under contract with the Milwaukee Brewers organization. The Milwaukee Brewers would send Chet to Fort Wayne in 1935 for his first taste of professional baseball. The Fort Wayne Chiefs were part of the "Three Eye" League (Illinois-Indiana-Iowa), a class B minor league team. The 23-year-old Laabs was phenomenal while playing in 87 games that summer. In his 362 at bats he stroked 139 hits for a .384 batting average. Twenty-two of the hits were doubles, 10 were triples and 24 were home runs for a .699 slugging percentage. He finished the 1935 season with the Milwaukee Brewers. In the 8 games he played in he hit 11 for 32, a .344 batting average with 2 doubles and a triple. With just one year in professional baseball, he was being called one of the best looking hitters in years. While many major league teams were interested in Chet Laabs, the Milwaukee Brewers had a close relationship with the Detroit Tigers and owner Henry Bendinger had promised them the first chance at him. The Detroit Tigers, managed by Mickey Cochrane, wasted no time in purchasing Laabs. The 5 foot 8 inch, 175 pound powerhouse would be joining Detroit in the spring of 1936. 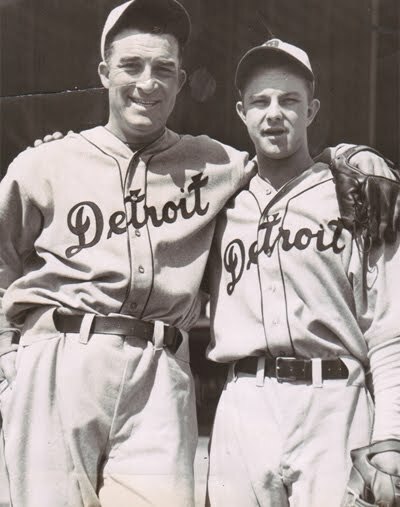 Chet Laabs lived up to the expectations as a great right handed hitter in spring training but Detroit wanted him to fill a void in their outfield, a position that he needed more experience with. So as part of a deal with the Brewers, they sent him back to Milwaukee for the 1936 campaign to get experience in the field. The "farming out" of Laabs to Milwaukee would prove to be a lucky break as the Milwaukee Brewers and Chet Laabs were about to have a heck of a season! The Milwaukee Brewers had a season to remember in 1936, winning their first American Association crown in 22 years. It will forever be considered one of Milwaukee's greatest teams. They were considered, at the time, the best minor league club in the country. Milwaukee not only won the pennant that year with a 90-64 record, they went on to defeat Kansas City in 4 straight games and dispatched the Indianapolis Indians 4 games to 1 to win the Shaughnessy playoffs. They made easy work of the International League's Buffalo Bisons, winning 4 out of 5 games to win the Little World Series. For the season their record was 102 wins with just 66 losses. The victory was a team effort and Chet Laabs contributed superbly to the Brew's season. With clutch hitting Laabs saved the day on many occasions. In the 157 games Chet played he stroked 203 hits in 675 at bats. Twenty-seven of the hits went for doubles, 16 were three-baggers, and a team-leading 42 were home runs. His batting average was a healthy .324 with a .619 slugging percentage and 150 RBIs for the 1936 season. In the outfield he finished with a .947 fielding average. A great 1936 campaign behind him, "Little Chester," one of the best natural hitters in the game of baseball, would rejoin the Detroit Tigers for the 1937 season. While he did well his first two years in the minor leagues, playing at baseball's highest level would be a challenge. 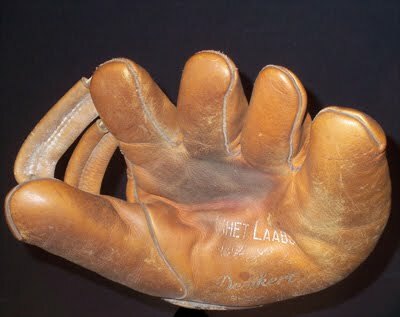 As previously mentioned, Mickey Cochrane had felt Laabs would have his best chance at making it in the bigs if he learned how to play the outfield. After watching him during the spring of 1936, he didn't think the small but powerful Milwaukeean was suited for playing in the infield. Sent down to the Brewers to gain experience, he had done well in his assignment with Milwaukee and was now considered ready to move on. While his hitting was never a question mark, it is interesting to note that Minneapolis skipper Donie Bush, whose Millers team played against Milwaukee in 1936, felt that he could be pitched to. 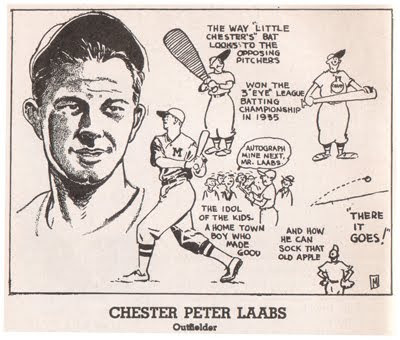 Chet Laabs would get his chance to prove himself a major league hitter and outfielder with the Tigers in 1937. In the 72 games played with them in 1937, the right-handed Laabs got 58 hits in 242 at bats, with 13 doubles, 5 triples and 8 home runs for the 2nd place Detroit Tigers. With only 37 RBIs, his output was nothing near his minor league totals. Nineteen thirty-eight wasn't much better with 211 at bats in 64 games played. Fifty hits were all he could muster with 7 doubles, 3 triples and 7 home runs. His batting average dropped to a dismal .237. Echoing the words of Donnie Bush, pitchers had found something on Chet that, at times, neutralized his power. "Laabs was stocky and muscular strong. He had a lot of power for a little guy. If he ever got a low one he'd hit it. But he could not hit a high fastball, he had a blind spot two feet tall." In 1939 the Detroit Tigers needed an "Ace" pitcher and traded Chet Laabs to the Browns along with Mark Christman (Milwaukee Brewers 1950-51) and four other players for Buck (Bobo) Newsom, who had won 20 games in 1938 for 7th place St Louis. Chet played only 5 games for the Tigers in 1939. Saint Louis was a good fit for Chet and the Browns in 1939. In the 95 games he hit for a .300 average with his new team. He collected 95 hits in his 317 at bats, 20 doubles, 5 triples and 10 four baggers. His RBI total for the year was 62. In 1940, Laabs played in 105 games for St Louis hitting, .271. For 1941 he played in 118 games and improved his batting average to .278. Chet had his best year with the St. Louis Browns in 1942. While playing in 144 games, Chet posted his career-best stats: 99 RBI's, 143 hits, 21 doubles, 7 triples, and 27 home runs, second only to Ted Williams (36). All-Star Chet Laabs played another full season in 1943, hitting 17 home runs, but saw his batting average fall to .250 with 85 runs batted in. He also led the league in one statistic that wasn't so desirable, strikeouts with 105. With the war going on, Chet's availability would be limited in 1944 due to his working full time in a war plant in St. Louis. 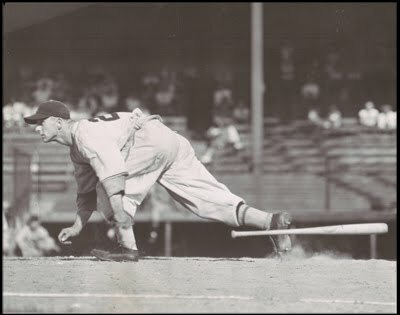 Even so, playing only on evenings and weekends, Chet helped the Browns in spite of his .234 batting average. His two home runs against the Yankees in the final game of the season lifted his team to a 5-2 victory for a one-game pennant win over Detroit. The Brownies would go on to lose the World Series to their hometown National League rivals, the St. Louis Cardinals, 4 games to 2. Chet Laabs would play two more years with the St. Louis Browns. He would scatter 26 hits in 35 games played in 1945. In 1946 he hit for a .261 average in his 80 games played. 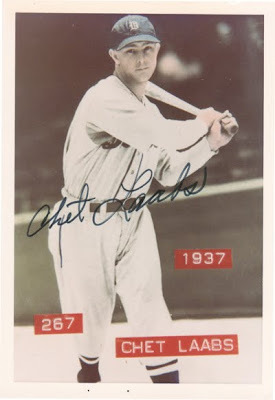 Chet Laabs would finish his major league career with the Philadelphia Athletics in 1947, playing in only 15 games. He would briefly return to minor league ball but be out of baseball as a player after the 1950 season. Milwaukee's Chet Laabs, like Al Simmons before him and Ken Keltner shortly thereafter, proved that the dreams of young sandlot baseball players making it to the big leagues can come true. I love this article featuring my great uncle Chet. I'd love to send you photos of the two autographed balls I have from him, to get your insight on them. Wonderful - drop me a line!